Denver Comiccon 2015 was amazing. Dylan and John were able to interview 8 writers and artists for DC comics as well as 2 bands that were at the convention. We had so many interviews that we had to breakup this coverage into 2 episodes. In this episode, Dylan and John also talk about their overall experience at the convention including cosplay, people they met, and the panels they were able to attend. Please join us Sunday, June 7th for the independent comic Brimstone and the Borderhounds. 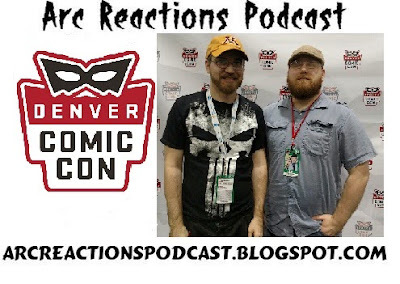 This entry was posted in Arc Reactions Podcast and tagged Amanda Conner, Arc Reactions Podcast, becky cloonan, Bombshells, Chemistry Club, Comics, Convergence, Copia, cosplay, DCC2015, Denver Comiccon, Elseworlds, Gotham Academy, Harley Quinn, heroines, Jeff King, Jimmy Palmiotti, Marguerite Bennett, podcast, power girl, Starfire by John. Bookmark the permalink.